Jiu-jitsu is with out doubt the oldest of the Japanese arts and anything older would have mostly come from China as the the first real Martial arts came from there when a legendary figure named BODHIDHARMA invented a way to protect ones self using his hands and feet.and on travels ended up teaching them to Shaolin Monks . Jujutsu or Jiujitsu as some may say ,the original Japanese term is Jujutsu ,is a Japanese martial art that stems back hundreds of years to around the 17th century or before ( the word ''Jujutsu ''did not come about till the 17th century) . It's a close quarter combat system where the jujutsu exponent would use a form of unarmed combat ( or in some cases a short range weapon) to defeat a armed or armored opponent. 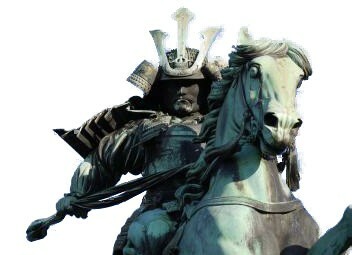 The idea was in Feudal Japan Samurai who came face to face with one other ,normally after being dismounted from their horse.,would use a series of Joint locks ,take-downs and close quarter strikes to subdue their opponent as trying to strike a foe covered in Armour at times would prove frivolous . Using the attackers own energy and strength against himself the Jujutsu exponent could take down a Armour clad samurai and live to tell the tale. Labelled ''The Gentle Art '' because size did not matter if the techniques where performed properly a smaller opponent could take care of a much larger adversary.. In reality Jujustu is a vast and varied art that it is believed to be something in the region of more then a thousand styles of Jujutsu as Families would devise their own form which was taught only to family members . ( for instance one style might have only Two or three practitioners while others may have thousands) . 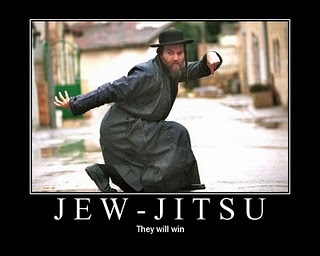 In reality Jujutsu has been around in some form from as far back as maybe the 12th century. It was the Muromachi period of 1333 to 1573 that what is now referred to as Old Style Jujutsu now , where Samurai would go up against opponents with more of a advantage in say having a large sword and having to subdue him using a shorter weapon or even grappling him. ( the thought of grappling someone with a long sword sounds risky if you ask me). For the modern equivalent that came about in the 17th century and more so later still in the Edo period of Japan or even the Tokugawa period of Japan (late 1800's ) ,it is believed to have been around 2000 different styles of Jujutsu at this time. Many systems or not considered to be direct forms of Old Style Jujutsu ,known as Nihon Ryu ,styles such as Hojojutsu which used the use of a cord or rope to tie up your opponent or the more widely known Takenouchi Ryu Jujutsu which focused on the use of Tanto,fans and such like. These are considered Nihon styles . The more modern styles which are linked more to what we see today are known as Gendai Jujutsu (Modern Jujutsu) . It's some of these later arts that have been taken up by Law enforcement in Japan and developed into specialized systems for the sole purpose of Police enforcement such as Kiesatsujutsu (Police Art) and Taiho Jujustu (arresting art) which is used by the Tokyo Police. Obviously from this other styles derived such as Judo which was invented by a great Jujutsu master namely ''Jigoro Kano''. But Jigoro's style was one of taking the what he thought the best and most useful moves of the different styles of Jujutsu and making his own style.In fact a alternative style of Jujutsu and was known as Kano Jujutsu ,but in the modern World his ideal of Judo has been watered down with many of the original techniques removed and where left with the Judo we have today,which is a shadow of Jigoro Kano's vision. There are some schools that still teach Judo as Jigoro Kano invented it but these are far and few between in the West,In fact Brazilian Juijitsu is more rooted in Jigoro Kano's vision then the Modern Judo we see today. Getting more up to date Brazilian Jujutsu has taken off in a big way ,this form of the art centers more on ground fighting once a opponent has been floored.We will delve more into Brazilian Jujutsu in a other featured page. Founders of some of the other arts which followed 'namely Karate-do / Judo / Akido / Muto Ryu Lai were all great Jujutsu masters . These masters were Kano Jigoro / Funakoshi Gichin / Tesshu Yamaoka and Ueshiba Morihei. So Jujutsu is an all round combative art and not a sport like some of the other arts that have come about Unlike say Judo which is sport orientated as the killer strikes have been removed in much the same way Olympic Taekwondo is a sport has some strikes are not allowed. / Funakoshi Gichin / Tesshu Yamaoka / Ueshiba Moihei and Kano Jigoro. Now as far as Jujutsu arriving in the West ,stories may vary ,but in the case of England ,the case is as follows. 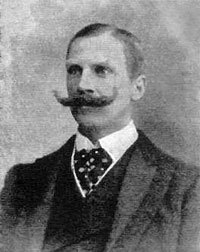 One Edward William Barton-Wright who had returned to England in 1898 after completing a job in Japan .,He was a engineer. On his return he announced that he had devised a new concept in fighting ,having done other arts like Boxing,Savate,Wrestling and such like. He called this new art Bartitsu ,using his own name and part of the word Jiujitsu. The styles drew from Shinden Fudo Ryu Jiujitsu of Sensei Terajima Kunichiro. As it came established other styles of Jiujitsu where incorporated as well as Boxing. 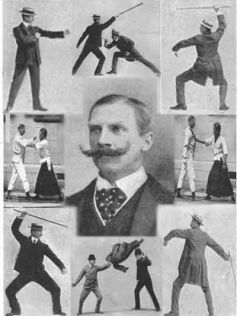 Articles in magazines where published and during the years of 1898 and 1902 the art of Bartitsu got known ,He opened a school in London's Soho. It's with this popularity that in correspondence with None other then Professor Jigoro Kano ,a great Jiujitsu master and the founder of Kodokan Judo that Barton -Wright arranged for visits from Japan of Japanese Jiujitsu instructors that included K.Tani , S Yamamoto and Yukio Tani a young 19 year old Jiujitsu Master. These three masters took classes at the Bartitsu club teaching well to do Londoner's . K Tani and Yamamoto returned to Japan ,but Yukio Tani stayed on and after this other instructors arrived ,the club grew to certain extent giving lessons in four styles of combat. In the end it did not last and by the end of 1902 the club had gone and instructors had left ,Yukio Tani had set up his own self defense club and also made money by being a Music Hall wrestler. Some say due to high tuition fees and trying to sell it to London's well to do citizens was not enough to see the art of Bartitsu thrive. 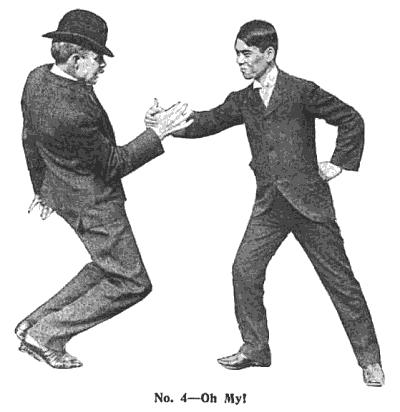 In-fact had it not been for Sir Arthur Conan -Doyle and his writings of the fictional Character Sherlock Holmes and the inclusion of the art of Bartitsu in one of his stories ,the art of Bartitsu may have been far forgotten . For Yukio Tani he was in a arrangement with one William Bankier ,a business promoter ,Yukio was competing in the Music Hall wrestling matches and in the period he competed only lost one match and that was to fellow Japanese named Taro Miyake in 1905. Over a course of six months Yukio was beating 20 men a week . In 1904 Yukio Tani and Taro Miyake set up a Ju-jitsu school in London’s Oxford Street at no' 305. The school only existed for about two years . In 1918 Yukio Tani was to become the first professional teacher in Jiujitsu at the London Budokwai. ,But after a visit from Professor Jigoro Kano in 1920 Tani was awarded a 2nd degree Black Belt in Judo and went on to attain a 4th degree Black Belt. In 1937 Yukio Tani suffered a stroke ,and this set him back ,he continued to teach from the side lines at the Budokwai until his death in 1950. 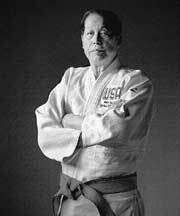 Now as far as America goes it all happened around the same time, One Esai Maeda ,a direct student of Jigoro Kano got the chance to travel to the States in 1904 with one of his Teachers ( Tsunejiro Tomita ) ,whilst there they got a chance to demonstrate Judo to Theodore Roosevelt.and the cadets at West Point. Theodore Roosevelt actually studied Judo on a regular basis. 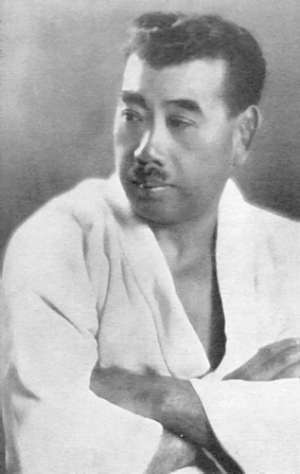 Now in 1914 Esai Maeda aka Count Koma was a Japanese Politician and world class Jiujitsu master who traveled to Brazil to establish a Japanese colony .In order to do this Esai Maeda befriended a Brazilian Business Man ,one Gastao Gracie. In return for his help Esai taught Gastao's oldest son Carlos Jiujitsu and he in turn ended up teaching his younger brothers. So you can see how Brazilian Jiu-jitsu came about and it's not as new as one may think. Unlike the other Japanese arts like Karate or Chinese arts of Kung Fu Jujutsu concentrates more on throwing a opponent ,using a series of techniques to either use your opponents weight against him or herself or with the use of leverage one can topple a opponent leaving him open for attack from a series of Joint locks and breaks ,chokes and strangles and even pressure point knock-out blows. Like Karate jujutsu is taught as a defense ,most techniques are from being attacked ,unlike Karate Jujutsu makes less use of devastating knock-out strikes but the use of finely tuned techniques that even a light weight can perform with ease. Of course all this throwing on the floor can be detrimental to your health ,and it's why Jujutsu exponents are taught the art of Break-falling ,it a way of taking the energy of being thrown and transferring it back in to the ground by slapping the floor prior to your body hitting the deck ,performed right break-falling can prevent series injury ,especially when experts in Jujutsu can throw you to the floor at a alarming rate . The break falls consist of various versions from the rolling break-fall, side break-fall,forflap,back and spins. For a full explanation of these break falls click here!. Joint locks are applied to any part of the body that has a joint such as fingers,wrists,Elbows,Ankles,Knees,Shoulders,Thighs,and even Necks. These techniques are important for gaining cooperation from a aggressor ,leaving him the only option but to submit or get his body broken ,as all joint locks has a emphasis where the joint can be broken ,of course in practice we don't break each others joints ( well not purposely, I have seen dislocations happen and have been on the receiving end of such a technique) . Choke holds are a other technique used ,applying a choke hold either using the opponents clothing or not ,if clothing is at hand it can form a useful lever in a choke hold ,but to be honest Choke holds should only be practiced under supervised action,as it's quite easy to dissociate the windpipe from it;s ligament resulting in suffocation and death. But saying this many practice chokes the wrong way ,the wrong way is when the choking arm is pushed against your opponents windpipe ,using your strength to utilize the choke , The proper way is yes to have the arm across the windpipe ,but use the arm like a camshaft of a car ,with the arm across the windpipe turn the arm so the hard bone of the arm manipulates the windpipe giving good grip on the neck ,as you turn the arm the opponent feels the hardness of the bone of the arm shutting his airway, quite nasty really. The other form of hold is the strangle hold ,this is probably safer to practice as there are many levels in the strangle ,with a strangle it works on the arteries on the side of the neck ,this results in stopping the blood-flow to the brain,resulting in a opponent falling unconscious in just 5 seconds or so, killing a opponent could take up to a minute . Now that does not mean you should see how long you can hold for in a strangle ,not unless you want to be a vegetable. As prolonged blood starvation to the brain could result in you being brain damaged . It's no fun training with brain damaged partner. So the end line is to be cautious when practicing these lethal techniques. Striking as in any martial art is fundamental, but in Jujutsu it's there to gain control so as to apply the joint locks ,chokes,throws and so forth. Unlike other arts like Karate or Taekwondo which utilize strikes as the finish to a confrontation..Of course with out striking you could not perform the many techniques in Jiujitsu ,but the strikes used are simple and without the need for extensive conditioning of the legs or arms. Yes of course you have to be fit but unlike a art like Taekwondo there's no excessive leg stretching as Jujutsu practitioners rarely kick above the solar Plexus. On top of that soft blocking is used in many styles ,so the need for hard style Karate blocking or wooden dummy training as in Wing Chun is not needed. Other then that you use what you can from fists ,elbows,ridge hands,knees ,what ever gets the job done. Throwing is a vital part of Jujutsu as many techniques end in the performance of a throw ,the Hip throw is of course is the most common used ,once in position ,after getting your cooperation from your adversary by striking him a few times or so. You can maneuver in to a hip throw position ,by wrapping your arm around his waist or back ,though the more correct way is around the waist as to high on the back just makes the throw harder and more opportunity for your opponent to get away. Grabbing with the other arm you drop your weight and ease you opponent over your own hip in a circular motion towards the floor ,making sure to keep hold of the grasped arm at all times , as once he lands you want to do some joint locking on the poor fellow. There all alternate throws that have the same principles ,some lock the arm when throwing others utilize the neck area. .throwing is all about physics and momentum ,making flooring your opponent a easy task. Take-downs are a different ball game as they often use strength unless you have perfected a perfect way of breaking your opponents balance ( Kuzushi) in take-downs like hocks , many take-downs can be utilized using other techniques first ,striking of course and the use of locks, but another use is pressure points ,along the body you have many areas to utilize where nerves run along the body from the leg to the head . By finding these points you can make a tough maneuver easy as pressure in the right spot can lend a aggressive adversary at your mercy as you perform all manner of leg throws,hocks,sweeping techniques to them. For the Full story on Professor Wally Jay click here! Soke James Blundell was only 14 when he signed up for the merchant Navy (he lied about his age to get in) . The Navy gave him the chance to see the World and see he did. 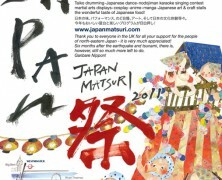 Witness not just to the atrocities of war but ,being from a Western world and seeing things of the Orient and Pacific. On his travels he was witness to all manner of fighting techniques ,but it was in Singapore that he met a Curio shop owner ,who sold all manner of trinkets. Browsing the shop he was ushered by the shop owner ,a small Chinese man by the name of Mr Kim. Taken to a back room where a small Dojo would be with all manner of weapons adorning the walls. This would be the start of Soke Blundells Martial journey.Over the years he would have a few different teachers ,but attained that his true teacher was Master Kim. In 1952 Soke Blundell became a trustee for a mansion in Liverpool called the Lowlands, it was here that he would use the mansions large basement to teach Jiujitsu ,many would come to train with him from all over ,later in the 1950's Soke Blundell would set up the British Jiu-Jitsu Association .The association runs till this day. Throughout the 60's and 70's people from afar would come to train with the then Professor Blundell ,in later years he had to semi retire due to a stroke which left him Paralyzed.He passed away in 1989. Richard Morris's first experience of Martial arts came when his Father and Uncle came back home after the Burma Campaign they had experienced the arts and passed on what they new to Richard. But his first real teacher was Professor Alf Morgan , one of the first men in the UK to be trained by Sensei Yokio Tani from Japan. Richard Morris attained his 4th degree black belt from Professor Morgan ,he passed away some time after. Other then that there's not much more info on Professor Morgan ,though here at K.I.T.G. we are trying to source more about him. After this he met Professor James Blundel and Robert Clarke. Richard Morris went on to become the chairman of the British Jiu-Jitsu Association (BJJA) and the Director of the World Jiu Jitsu Federation (WJJF) in partner ship with Professor James Blundel and Robert Clarke. Now from what i Know the Richard Morris and James Blundel eventually broke away from WJJF ,for reasons i won't go into here. This was in 1986 when Richard Morris resigned from both posts in the WJJF and BJJA. It was now that he set up and founded Jiu jitsu International in a bid to bring together the best in Jiu-Jitsu ,not just in the UK ,but Worldwide. In 1992 he co-founded the World Kobudo Federation with John Therien and Alain Sailly ,bringing together more and more World renowned masters ,he ran the UK part of the organization along with Bryan Cheek who was appointed ''International Cordinator'' they had met when Bryan got involved with Professor James Blundell ,they formed a alliance with Other Masters from Europe and Canada and the Eastern Block. Around 2000 ,The World Kobudo broke up in the UK ( though John Therien and Alain Sailly still run a Worldwide WKF) after Bryan Cheek founded his own Organization and Richard Morris concentrated on Jiu-Jitsu International ,with factions from around the World either going with Jiu-Jitsu International or Bryan Cheeks new formed WEBBS ,while others went there own way. Now with a vast array of talent teaching in many countries Worldwide Jiu-Jitsu International has a following right across Europe and is particularly strong in Sweden and Finland. I can honestly say it has been my privilege to have been taught By Soke Richard Morris in the 90's through one of the clubs under the World Kobudo banner. Soke Richard Morris is a legend in Jiujitsu circles worldwide and even after a break due to illness in the early millennium he seems to be back fitter and leaner then ever. Bryan Cheek is a name most people within the Judo and Jiu Jitsu circles will recognize ,training for fifty years and gaining his black belt in 1969, after training for eleven years . His teacher since 1964 was one Otani Matsuru , ( a 8th Dan Judoka ,born 1896 ,died 1977) . The last Grade Bryan received from Otani Matsura was 4th Dan Judo. 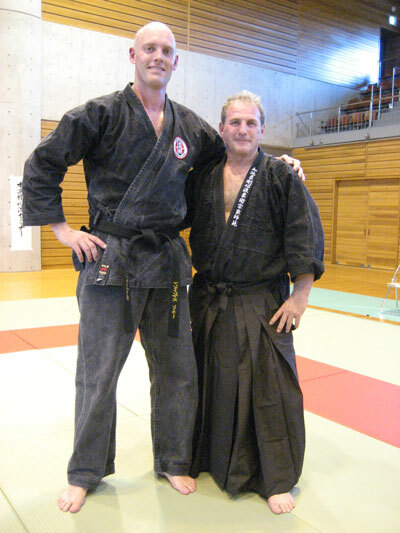 Bryan also got to train under Master Kenshiro Abbe, the holder of 8th dan in Judo, 6th dan in Kendo, Kudo, Aikido and Karate for a time to giving him a wide range of experience. In 1972 under the guidance of his Japanese teacher ,Bryan opened a Judo club ,''The Judo Ippon Club''. It's was a traditional style Judo club with a emphasis on Old School teachings. Having attained a masters in Judo, Bryan became interested in Close disciplines and the art of Jiu-Jitsu ,and began to train in Jiu-jitsu with Professor James Blundell who had set up the BJJA ,with whom Richard Morris was the Chairman of, plus the added bonus of Robert Clarke's WJJF of which Both Professor Blundell and Richard Morris where part of. 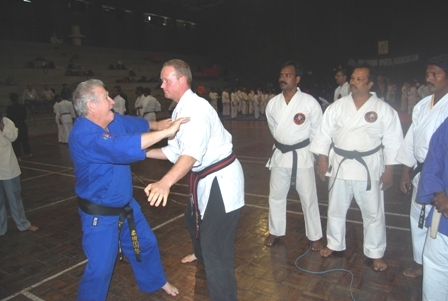 Bryan achieved a 6th dan in Jujutsu ,which was awarded by Robert Clarke in 1993..By then Jiu-jitsu International and the WKF where in full swing and Bryan came on board as the International coordinator for both Organizations. 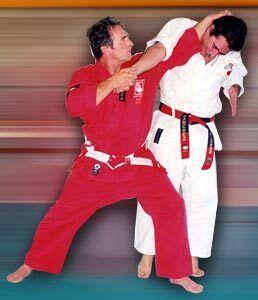 In 1996 Bryan would attain a 7th Dan in Jujutsu from the WKF grading Committee. In 2000 Bryan would leave the WKF and set up his own organization ''WEBBS'' ,which ended up breaking the WKF up in the UK ,as splinter groups broke away or went with Bryan's new Organization or stayed with Richard Morris's Jiujitsu International. Over the years Bryan Cheek has won over 300 hundred trophies and has taught all across the world including in Japan ,and has taught various law enforcement agencies including the Russian Tax Police. Founder of W.E.B.B.S. 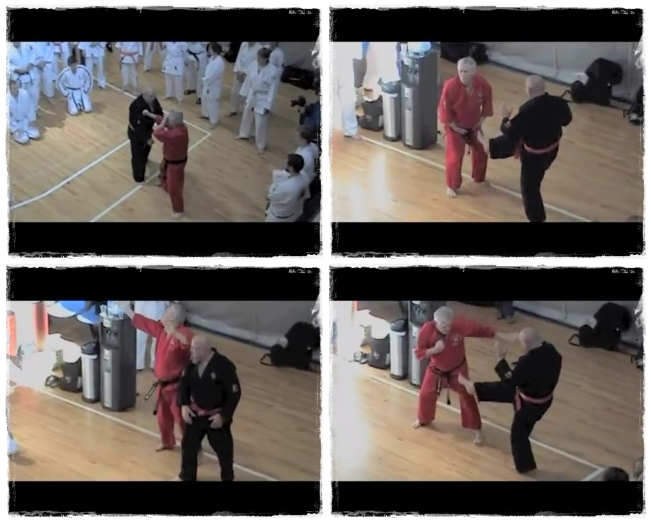 an organization that spans the world with lots of instructors and students.Check out the video's of Soke Cheek below. 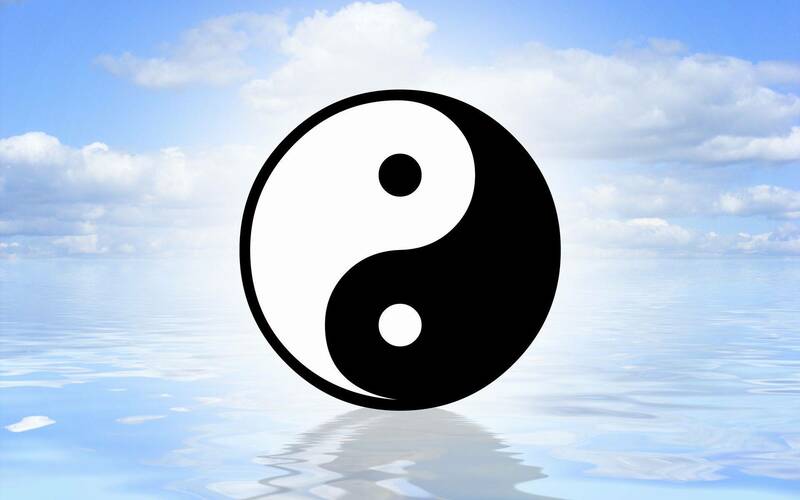 Hanshi John Therien has been into martial arts from the age of 13 ,when after reading a book by Bruce Tegner ,decided he would take up training in the art of Jiujitsu. In his class in Ottawa Canada where just ten pupils and the instructor . His Instructor was a Policeman by the name of George Sylvain. 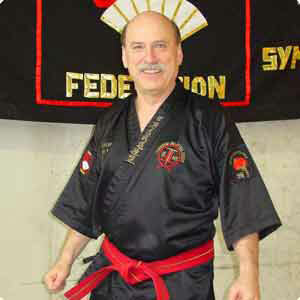 This led to a life long interest in the arts,since 1968 he founded the Therien Jiu-Jitsu & Kickboxing organization, Canada's largest and most successful group of Martial Arts schools.He also co-founded the the World Kobudo Federation with Alain Sailly and Richard Morris back in 1992. John also Trained and managed Jean Yves -Theriault ,a 23 time World Kick-boxing champion. Who runs the Kick-boxing side of things at the TherienJiu-jitsu and Kick-boxing Organization. Having graded more then 750 Black Belts and having a staggering 3000 plus pupils in his Can-Ryu system. The World Kobudo Federation has members in more then 30 countries with more then 20'000 members . With a number of schools in his organization ,he has always made sure that his schools have been set up for the promotion of Martial arts and Not as a Business. John Therien has always said that the one thing that must not suffer is Quality in the training,which has happened in many schools in the USA and Canada. And along with his partners have just opened a New Dojo in 2011 ,which i'm sure will give his Pupils and himself a lot of Joy. Professor J Mc'Dade first arrived in London from Glasgow where he met Sensei Richard Morris who introduced him to Jiu-jitsu and went on to gain his black belt in 1968.Later on Richard Morris amalgamated with Professor James Blundell who was the founder of the British Jiu Jitsu association . And then went on as mentioned above to become the chairman of the British Jiu Jitsu federation and the director of the World Jiu jitsu federation where Professor James Mc'Dade was his head instructor for many years ,until Professor Mc'Dade went on to set up his own Jiu Jitsu schools 'Meadway Jiu Jitsu'' , which had various clubs across north London,which he ran with his son. It's actually under the Meadway Jiujitsu banner that i myself first met Professor James McDade when i joined one of the clubs he ran in North London. He must be one of the most patient people i have ever met, as i was no natural at this art , i always enjoyed my classes with the Professor and it was shame when the club i frequented had to close. Professor is truly one of the pioneers of Jiujitsu in the UK. Professor James McDade currently runs the Total Self Defence Jiujitsu club with his son Stephen McDade. Stephen McDade has been training in Jiujitsu since first trying it in 1973 at a North London Club his Father ( Professor James McDade) took him to . He gained his Black belt by 1983 , after a stint in the Army in 1986 where he fought for his companies Boxing team , but due to a prior injury retired a couple years later. It's here that Stephen McDade got truly back into Jijujitsu , training at his fathers clubs in North London. Mid 90's is where i first met Stephen McDade when i joined one of the North London Clubs at Lee Valley his father ran.The then Meadway Jiujitsu had around four different clubs around at the time. I found Stephen a patient but very much a man guided by the tradition of the art ,something obviously gained by his father ,which is what appealed to me. Though i did not train a lot with Stephen i did frequent his sessions on occasion at Whetstone and Muswill Hill. After Lee Valley closed i did train at Tottenham for a while under one of his Black Belts , The Late Bob Carmichael . Stephen McDade and His Father now run two clubs under the Total Self Defence banner. One in Hertfordshire and the only remaining North London club in Whetstone. In March 2015 Gained his 8th Degree Black Belt in Jiujitsu from two bodies , The title of Hachidan 8th Degree from Total Self Defence Master Professor James McDade and Kyoshi 8th Degree Black Belt from Jiujitsu International founder Soke Richard Morris. Hanshi Alain Sailly is a Master of the arts ,having studied Conventional Martial arts up until 1978,he found that the Optimization of the Body was not being used enough , it's from here that he developed using ideas and methods from Haka Ryu Ji-jitsu and Akijutsu. It's combining these methods with other styles that ''Goshindo '' was born . Goshindo is one of the most fluid forms of Martial arts you might come across . 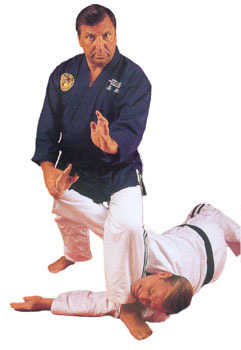 Because of its origins, Goshindo is constructed as a set of techniques including both projections, key bottlenecks, forms of control, but also strikes and rotational movements as they can exist in other martial arts. The idea is to form protection for oneself from a attacker whilst maintaining a Harmonious form. A keen sports man who has excelled in Swimming and other activities Kyoshi Alain Sailly's elegant moves and precision are awe inspiring to watch . This has earned him much respect throughout the World as well as in his home land of France. 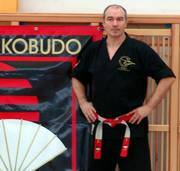 Co-Founder of the World Kobudo Federation and hosted their first Convention back in 1993. Trainer of the Austrian Jiu-jitsu Team and the Austrian Anti-Terrorist Police as well as the Canadian Police and Hungarian Police forces. Robert Clark founded the WJJF ,which is based in Liverpool England. With over forty years experience in Jiu-jitsu and a series of Books and Training DVD'S released to promote and aid the art of Jiu-jitsu. His organization has one of the largest number of members from around the World. On the 13th February 2012 Soke Robert Clarke passed away ,as per his wishes a small family funeral will be held for him. Anthony J .Bailey is a martial artist of some forty years experience , he has trained in Judo ,Karate,Akido and various other arts and holds black belts in those arts. He's also a former Heavyweight Champion of Combat Ju-jitsu. 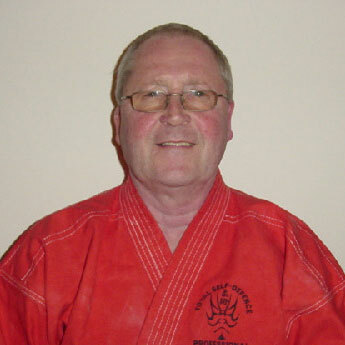 With a passion for Jujutsu which he started back in 1976 when he studied Kano Jujutsu. He tested the waters with Aikijujutsu and like many Martial artists ,found something that bonded with him. 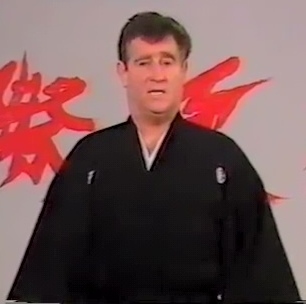 In 1994 Shihan Bailey devised a style of Juijitsu based on his years of training in various arts and styles. His system named Mizu -Ryu Ju-Jitsu includes various techniques combined from various styles and adapted to form a well rounded system . From Joint locks,pressure points ,basic self defense techniques combined with meditation but keeping with traditional methods. In 1997 he was awarded his title of Shihan for Aikijujutsu , in 2012 he was inducted into the Martial Arts Hall of Fame for achievements within the martial arts. But if you where to ask him what dan grade he holds in Mizu Ryu he would say i hold no grade , because he believes as it's a style of his own making he can not award himself titles within the system . 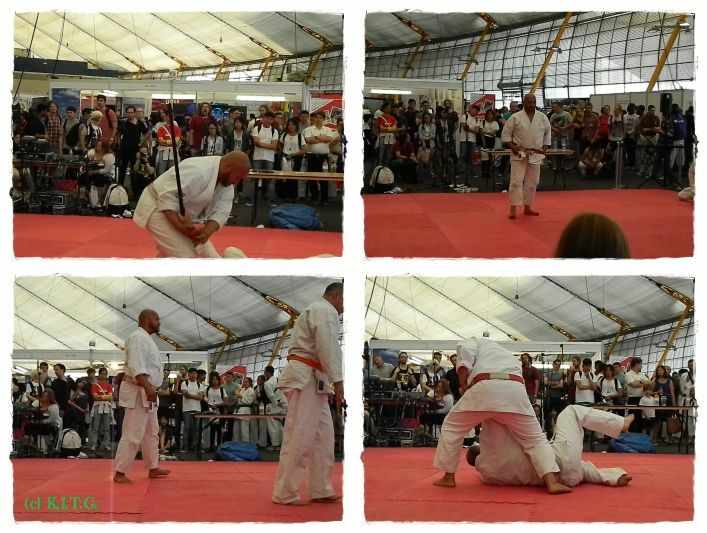 Shihan Bailey has featured at the London Hyper Japan shows on a number of occasions and i have seen him and his pupils perform each time. Their techniques are effective and street wise and they always seem to put on a good show for the crowd. Unlike some of the other Juijitsu Masters featured on this page i have no real first hand experience of his style other then seeing it in action but hope maybe in the future to get a hands on experience one day. Due to certain circumstances i left training at Meadway and took up other means of exorcise .But was saddened to hear of his departure from this world due to cancer in 2004. A truly exceptional man and a great Jiu Jitsu teacher. Always in our memory and never forgotten like any great master should be. We will be looking further at these old style Schools in a further feature on Jujutsu ,coming soon. Sanshiro Sugata - 1943, A classic from Akira Kurosawa. aka Judo Saga. Sanshiro Sugata pt2 -1945 ,A sequel to Kurosawa's classic ,though he was reluctant to make it. Throwdown -2004 , Aaron Kwok stars in this Johnie To film about the art of Judoka . RedBelt 2008 - A film from David Mamet that takes a different view of the art. Red Beard - 1965 - Toshiro Mifune stars in this Kurosawa classic ,only 90 seconds of Action ,but for a Jiu-jitsu/Judo fan it's a must see. 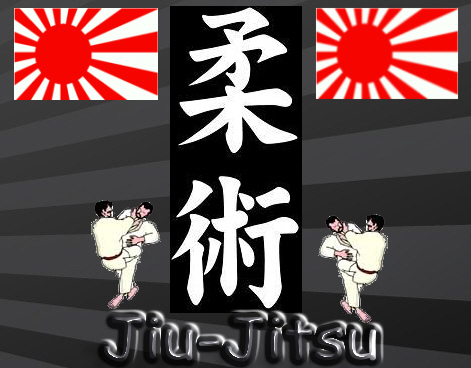 On this Page we have concentrated on the Japanese form of Jiu-Jitsu ,of course as mentioned on this very page how Jiu-jitsu/Judo was introduced to Brazil in the early 1900's .Brazilian Jiu-jitsu was born and started a popularity increase in all forms of Jiu-jitsu in the 90's and beyond. Here at K.I.T.G. we are in the process of compiling a dedicated page for Brazilian Jiu-jitsu ,so that you may get the whole Jiu-jitsu story. Of course we will focus on the Pioneers and of Course Brazilian Jiu-jitsu exponents in the UK ,as we are a UK site. Watch This Space! Links to some of the clubs appear in the sites Link page. If you believe that there are other UK based Jiujitsu Masters that should be featured on this page please email the name ,style and website link of the individual to the email address below.